The Progressive Gazette: Foiled in Crimea, Is Obama Eyeing Syria Strike? Foiled in Crimea, Is Obama Eyeing Syria Strike? There is danger in making dramatic but idle threats. President Obama and his administration have been given to extremely muscular rhetoric to warn adversaries away from certain actions only to back down when their warnings are not heeded. 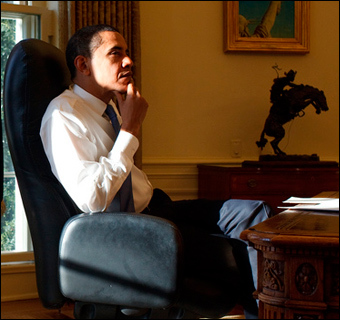 Obama is likely thinking up more lies to tell the American people. The neocons pounce on such unwise habits, attempting to trap the administration by its own rhetoric into fulfilling its wildest threats. It is a lose-lose with the administration but for some reason they keep it up. With Crimea, Kerry made threats of a “huge price to pay” for Russia not heeding US demands to recognize and make peace with a government in Ukraine put in power by a US-backed coup. Obama warned “there will be costs” to Russia’s actions in Ukraine and Crimea. In the end, Crimea is now gone from Ukraine and thus far the US response has been rather less than advertised. A few Russian lawmakers are under US sanctions, including, strangely, Yelena Mizulina, who had little to do with Crimea and Ukraine but found herself on Washington’s “hate list” for drafting the infamous law to ban homosexual propaganda to minors in Russia. Perhaps Crimea gave Washington the opportunity to settle old scores as well.